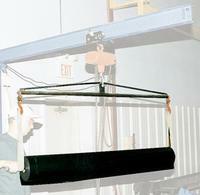 Adjustable roll lifter utilizes your overhead hoist to position roll material. Core rod is 2½" diameter. Ideal when headroom is limited. Designed to meet ASME B30.20. Width is adjustable on 4" increments.